Finding Wonderland: The WritingYA Weblog (archive): Toon Thursday: Aren't You Glad Writers Don't Have Reality Shows? 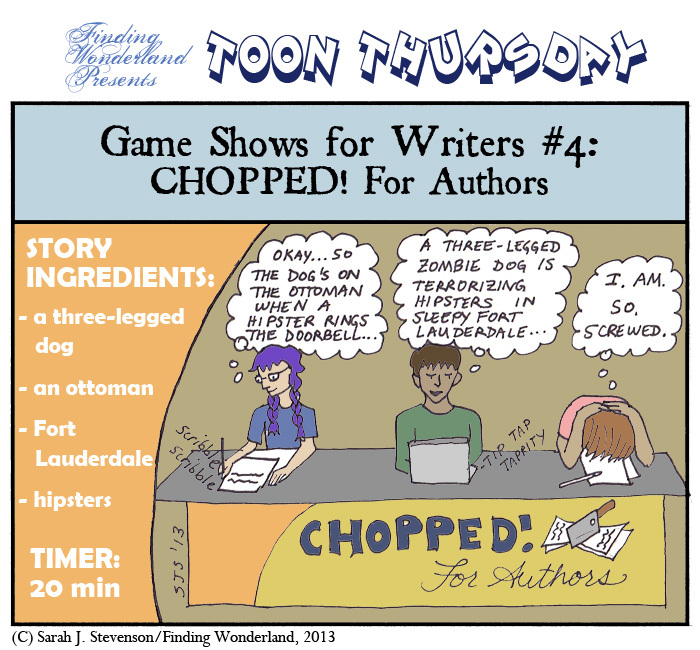 Toon Thursday: Aren't You Glad Writers Don't Have Reality Shows? ...I sure am! Especially since I seem to keep thinking up horrific scenarios in which writers enter into ludicrous competitions for the delectation of a live audience, as if it isn't already enough that our work goes out into the world for judgment and potential scorn, subject to the capricious moods of the readers. So here you go, and consider yourselves lucky, my friends. I might read the one about the zombie dog. Tanita: I think you've given me fodder for a future toon...except it may be more of a "what authors wear: the myth/the reality" kind of thing. Toon Thursday: So It's Come to This.